Hot off the wire, from yesterday's Perijove #11, via Kevin Gill. Just another gorgeous JunoCam pic. From Perijove #11, via Kevin Gill. Besides working on JunoCam images Kevin Gill has been digging into photos taken by the Voyager probes, reprocessing the original image data with current software and techniques. Here's Uranus' moon Miranda, from Voyager 2 on 24 January 1986. Also from Perijove #11, via Gerald Eichstadt and Seán Doran. Here's a JunoCam pic from Perijove (flyby) #3, reprocessed by Gerald Eichstadt to enhance detail. Via Seán Doran. From Perijove #8, newly processed by Seán Doran. Absolutely amazing. Thank you for posting this. Glad folks are continuing to enjoy the pics & articles. This thread has a new home, and so here's a new JunoCam image from the most recent "Perijove" (flyby). Looking down at (relative to us) the planet's northern hemisphere. Initial RAW processing and compositing by Gerald Eichstädt with further processing, mostly color/tonal, by Seán Doran. Among the initial processing tools used is Mathematica (for scripting). Good to see this got a new home! Where can I book a trip there? Maybe ask Elon Musk when (and how) he plans to get rid of his current personal Tesla. 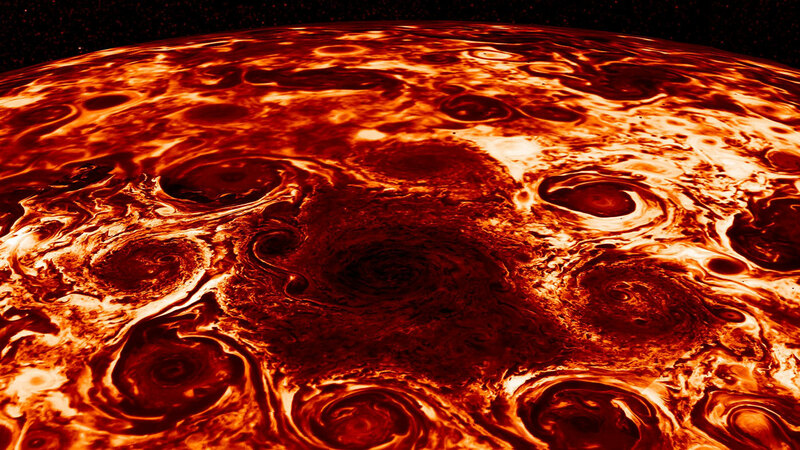 Just to note: if you got as close to Jupiter as Juno gets you'd be fried into something with a charcoal outer crust and the inner consistency of marzipan. Also from Perijove #11, the latest Juno flyby. Taken February 7th by JunoCam at an altitude of 12195 km above Jupiter's atmosphere, 49.2° North latitude. Processing by Matt Brealey and Gustavo B C.
One more from Perijove #11. Processed by Seán Doran after pre-processing by Gerald Eichstädt & Matt Brealey. "True color" according to Seán. Same location as previous pic here. Here's a bit of Jupiter artwork derived from a JunoCam image taken during Perijove #10. Created by a fellow named Rick Lundh. From yesterday's Juno flyby (aka "Perijove 12"), processed by Kevin Gill. Northern hemisphere. Another take on the "Easter egg" storm imaged by JunoCam during Perijove #12, via Gerald Eichstädt and Seán Doran.